Campus life at IHM Hyderabad is not only about hectic campus routine or practical classes but it is also a pathway to personality enhancement. A second year student Shweta Harinder, who is pursuing three years full time hotel management undergraduate course from IHM Hyderabad, shares her campus life experience and how it enabled her move beyond her comfort zone. As a part of Careers360 “My Campus, My Life” series, we bring life experienced by a hospitality student Shweta Harinder at IHM Hyderabad in terms of benefits reaped from practical classes, role of assignments or grooming classes in giving professional edge, and fun activities of the campus life. Shweta talks how she accustomed herself to long practical classes adapted campus routine which in the beginning was a challenge for her. 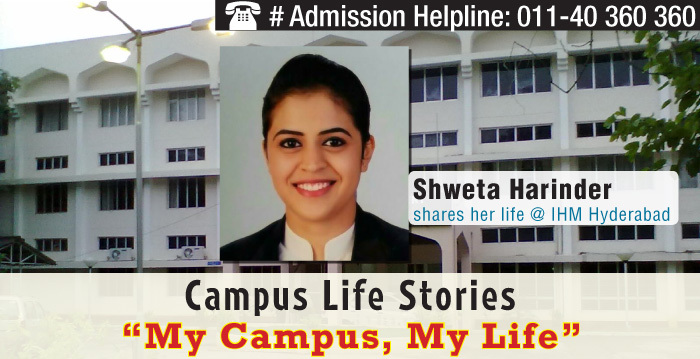 Explore IHM, Hyderabad Campus life with Shweta Harinder. Careers360: Describe your life at IHM Hyderabad. Please share some benefits of grooming classes. Shweta Harinder: I would describe my life at IHM Hyderabad as a guiding force which enabled me to move beyond my comfort zone. I learned that pleasing personality and displaying calm under tough situations is the pre requisite of hospitality professionals. I have emerged as a refined person, who is equipped with skills to excel in the hospitality sector. The grooming classes have enhanced my personality and practical assignments have increased my physical fitness and stamina, due to which I can easily adapt myself with the long working hours. Careers360: Share what was the most difficult part of adjusting with the new campus life. What you do on weekends? Shweta Harinder: Initially, there were not many challenges with which I was unable to cope. However, to stand and work continuously for 4 -5 hours in the practical classes was something with which adjusting was struggling phase for me. However, later I adapted with campus routine and realized that the hospitality industry’s working schedule required us to be physically fit and prompt. We have classes on 5 days a week, so dividing weekly time between studies and other activities is planned in advance. I try to finish my assignments on Friday and Saturday. Thus, on most of the weekends I have time to go out with my friends and spend quality time with my family members. Careers360:Which are the best hangout zones at IHM, Hyderabad? Shweta Harinder: The best hangout places near the campus are outlets of popular American fast food restaurants like Subway and U.S. Pizza. Many other local food stalls are equally famous among students. The Bakery shop “Just Bake”, and snacks-tea stall “Daffodils” are also preferred by students to hangout with friends. Careers360: What is your opinion about the infrastructure of the institution? How are faculty members, laboratories, mess, and everything else? Shweta Harinder: Academic building of IHM Hyderabad has well furnished classrooms and laboratories with LCD projectors. The fine dining hall for students is very well ventilated and spacious. Both, the Basic and Advance Training Kitchen are fully equipped to cater to needs of all the students. The well maintained library, computer lab, front office lab, and housekeeping lab helps students to practice and perform practicals. Faculty members are very supportive and co operative to guide us on professional level. The highly qualified and experience-rich teachers are experts in their respective areas, so we are lucky to gain more knowledge from them. Careers360: Are there any Guest lecturers conducted at campus? List a few along with the topic. Shweta Harinder: Yes, special and guest lecturers are among the frequent activities which are conducted at the campus. Alumni and leaders from hospitality industry delivers lecture on Laundry Operations, Ikebana, Bonsai and Personality Development. Recently, Azim Virani, Executive Housekeeper, Royal Caribbean Cruise liners and an alumnus of IHM Hyderabad, offered tips on ways to ace campus interview to students in a special class conducted by him. Careers360: Which other extracurricular/fun activities make your campus unique and interesting? Shweta Harinder: We celebrate all the festivals which are celebrated around the globe with great fervor. Each festival celebration is followed by group lunch or dinner, where students and faculty eat together. All the festival arrangements- deciding of the menu, cooking food, serving till post dinner services, are done by students. Teachers are always willing to extend a helping hand. We also celebrate annual fresher’s party with great pomp and show. Careers360: How many industrial visits are included in your hotel management course curriculum? Share your experience. Shweta Harinder: We have an industrial training in the 2nd year of the course. Undertaking the training is mandatory for us. Students not attending the same are not promoted to the next semester; it is a compulsion to attend this training. The training helps us to get a brief insight of what future has to offer us and gives exposure to industries and good learning experience. Careers360: How do you get to know about the latest happenings in the college? Is there any in-house magazine or something else for that? Shweta Harinder: IHM Hyderabad has an in-house magazine “cackle” which is published annually. The magazine briefs on all events and competitions of the college and the articles are contributed as well as edited by students only. Soon, a newsletter titled “Referral Point” that will inform the latest happenings at IHM Hyderabad is about to launch.